Some of our most commonly coded conditions, i.e. 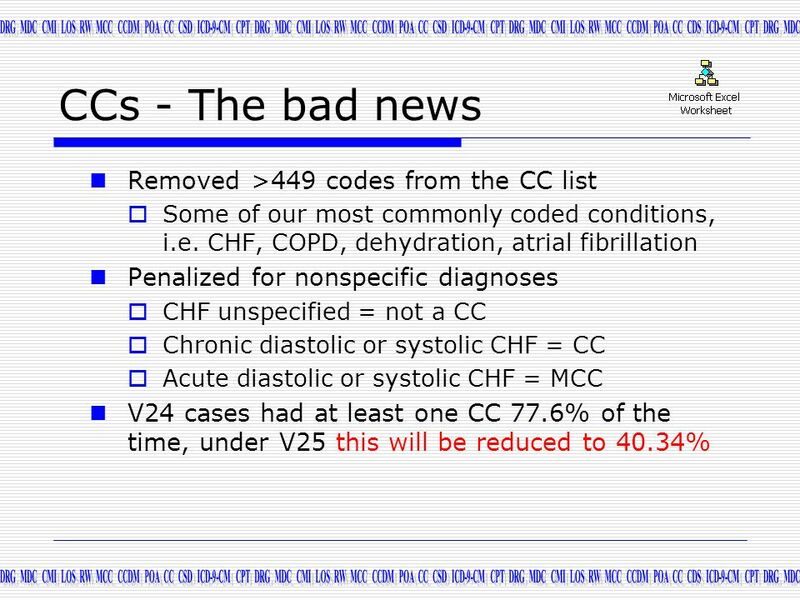 CHF, COPD, dehydration, atrial fibrillation Penalized for nonspecific diagnoses CHF unspecified = not a CC Chronic diastolic or systolic CHF = CC Acute diastolic or systolic CHF = MCC V24 cases had at least one CC 77.6% of the time, under V25 this will be reduced to 40.34% Table 6I contains the complete CC Exclusions. 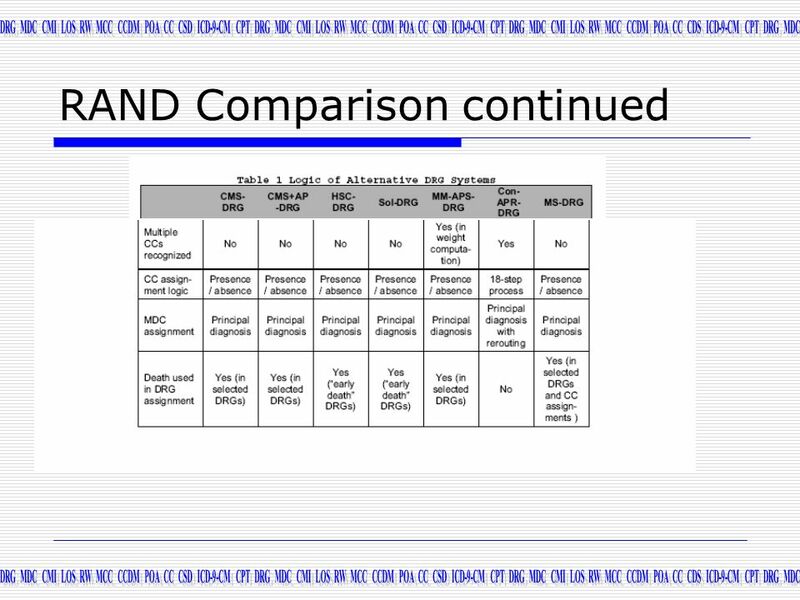 Table 6I shows the principal diagnoses for which there is a CC exclusion. 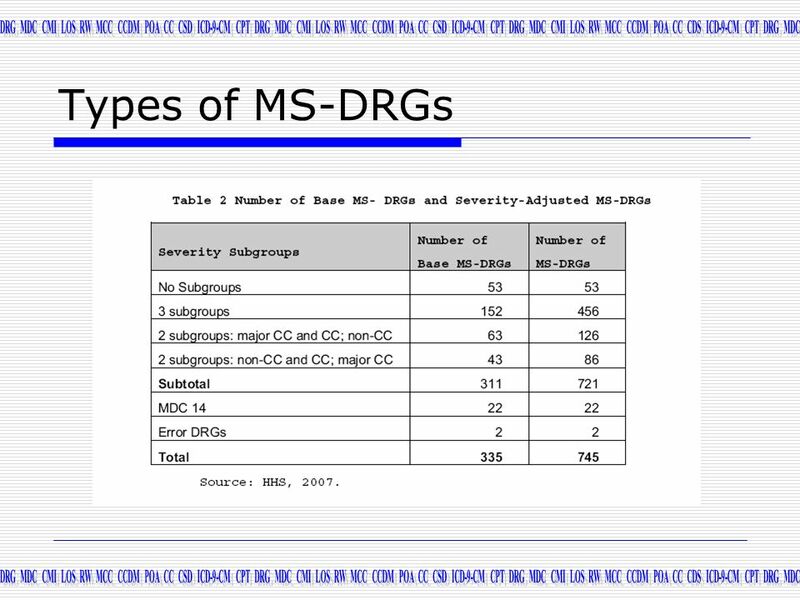 Each of these principal diagnoses is shown with an asterisk, and the conditions that will not count as a CC, are provided in an indented column immediately following the affected principal diagnosis. 9 CCs - The Good News ? 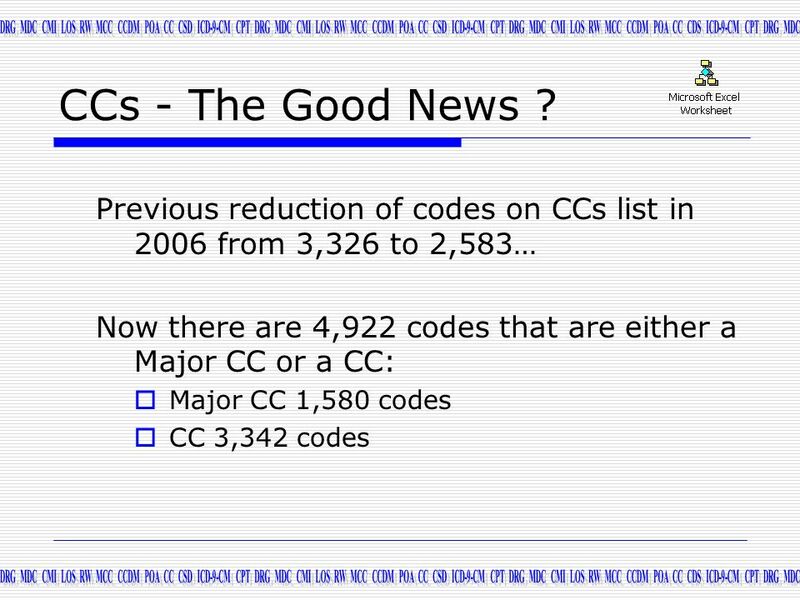 Previous reduction of codes on CCs list in 2006 from 3,326 to 2,583… Now there are 4,922 codes that are either a Major CC or a CC: Major CC 1,580 codes CC 3,342 codes Complications/Comorbidities 􀂃 Reduced CC list from 3,326 to 2,583 diagnoses codes in 2006; now there are 4,922 codes that are either a Major CC or a CC: 􀂃 Major CC 1,580 codes 􀂃 CC 3,342 codes 􀂃 Patients under V 24 had at least one CC 77.6% of the time, under the proposed MS-DRG system, this will be reduced to 40.34%. 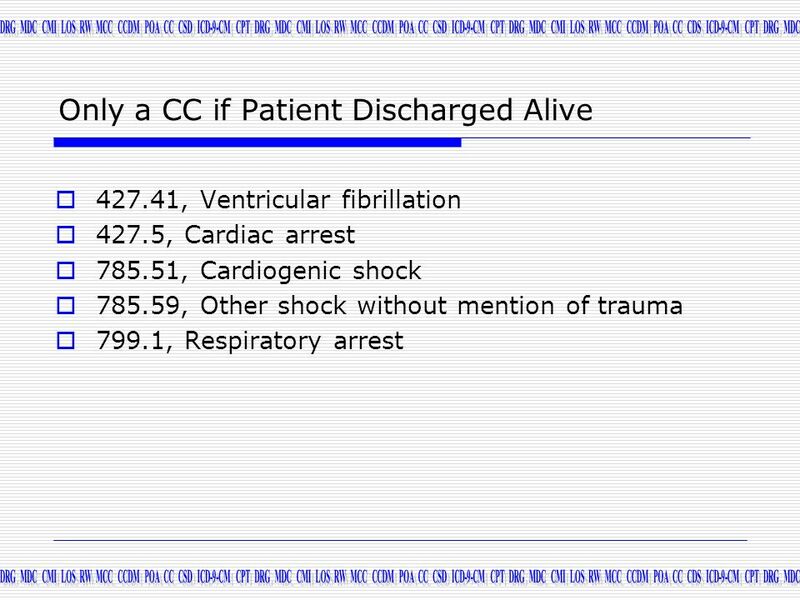 427.41, Ventricular fibrillation 427.5, Cardiac arrest 785.51, Cardiogenic shock 785.59, Other shock without mention of trauma 799.1, Respiratory arrest CMS – patients who are DC’d alive after one of these conditions use resources consistent with an MCC. 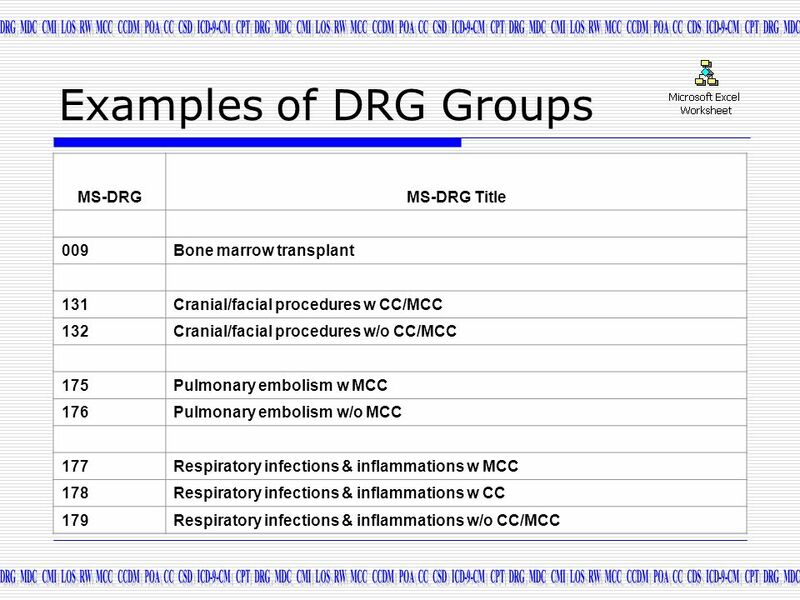 Patients who expire “could legitimately have one of these diagnoses” so the fact that someone expires is not going to drive the MCC. 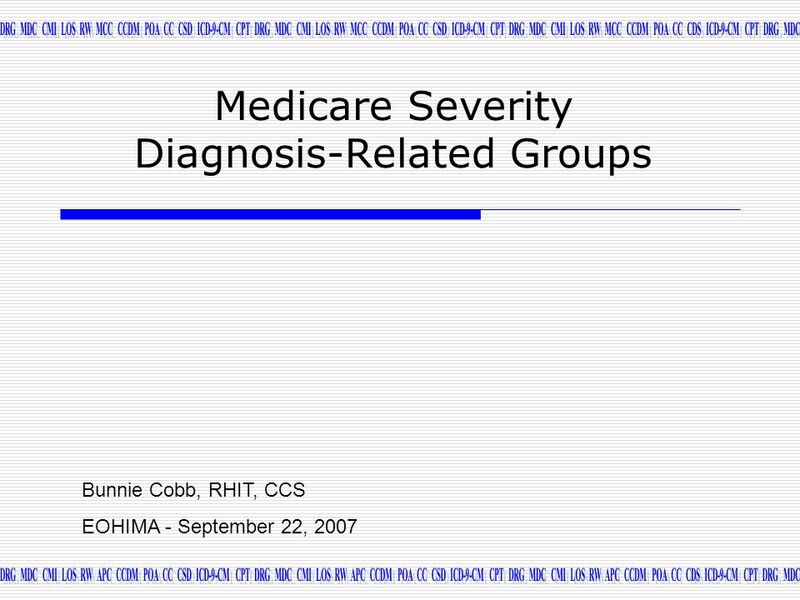 Download ppt "Medicare Severity Diagnosis-Related Groups"
Building a New Payment System: Stakeholder Perspectives on Principles and Elements Robert L. Broadway, FHFMA VP of Corporate Strategy, Bethesda Healthcare. Research and analysis by Avalere Health Physician Ownership and Self-referral in Hospitals: Research on Negative Effects Grows April 2008. 1 Survey on the 75% Rules Impact on Rehab Hospitals and Units and the Patients They Serve October 2003 FINDINGS. 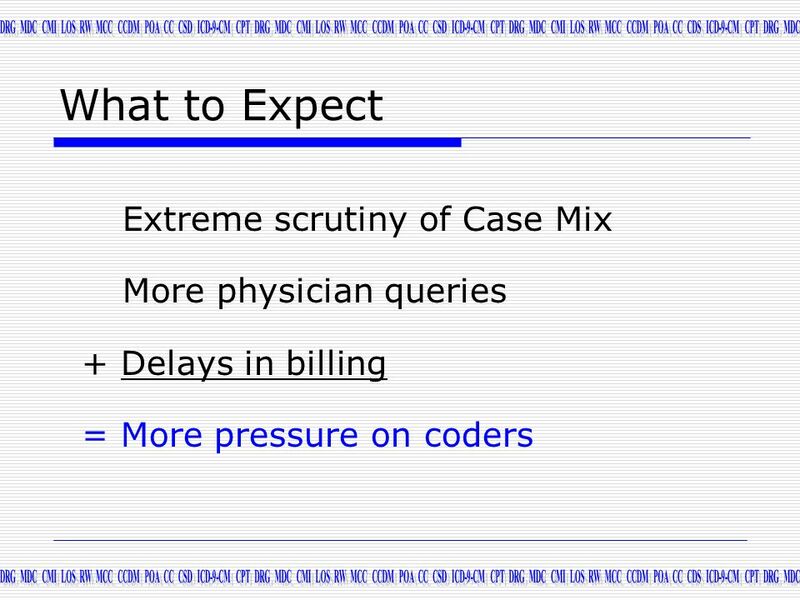 1 Capital BlueCross ICD-10 Toolkit. 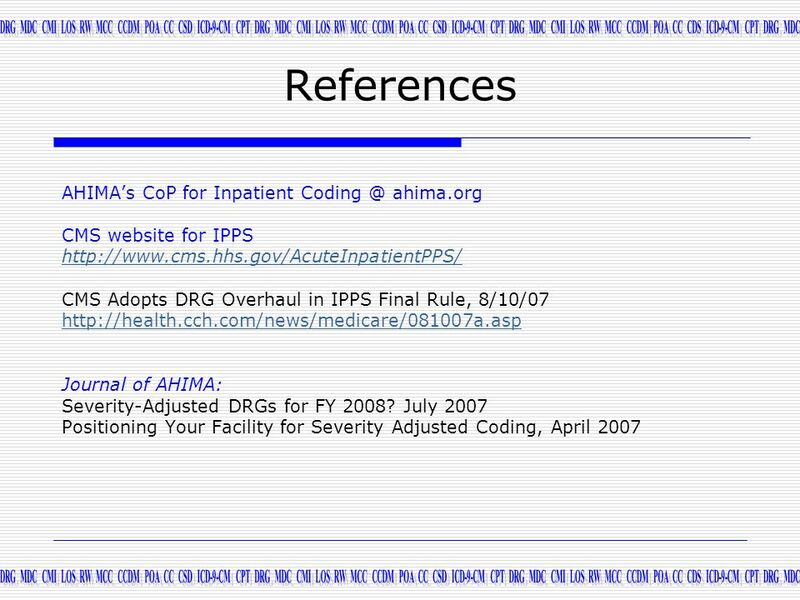 2 Introduction Capital BlueCross and ICD-10 Capital BlueCross is dedicated to assisting providers transition to ICD-10. Projecting Hospital Acute Bed Needs for Workshop organized by US Embassy and the Belgian Health Federal Public Service March 21, 2006 Prof. Dr. 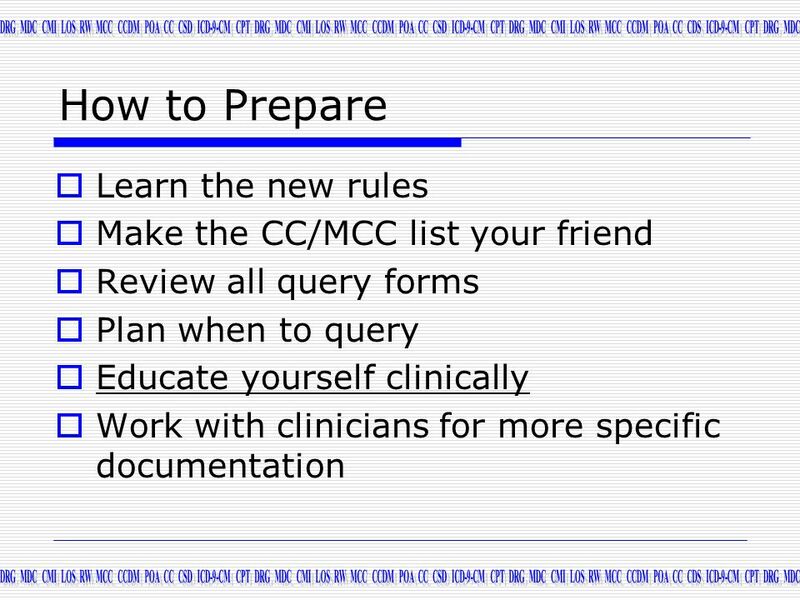 The Michigan Primary Care Transformation (MiPCT) Project PO Webinar July 9, 2014 Part Two – New CMS Chronic Care Code Update 1. 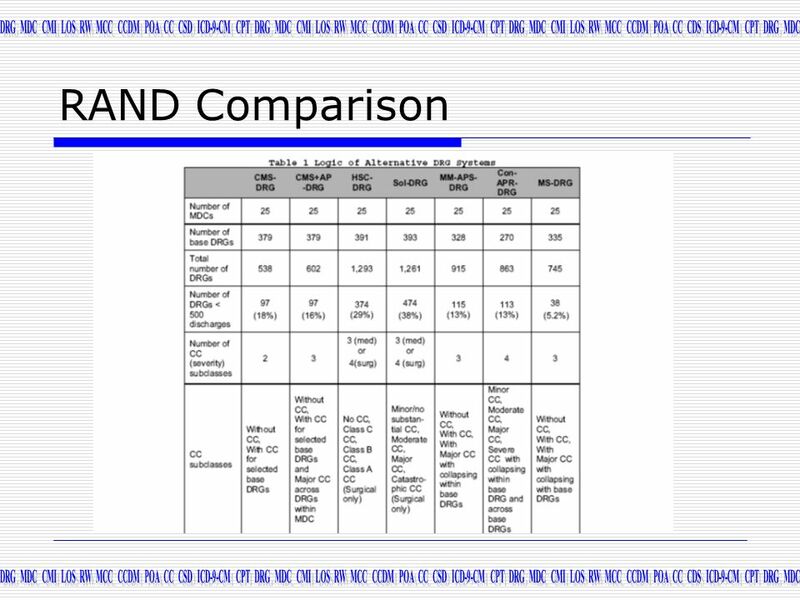 THE COMMONWEALTH FUND Figure 1. More Than Two-Thirds of Opinion Leaders Say Current Payment System Is Not Effective at Encouraging High Quality of Care. 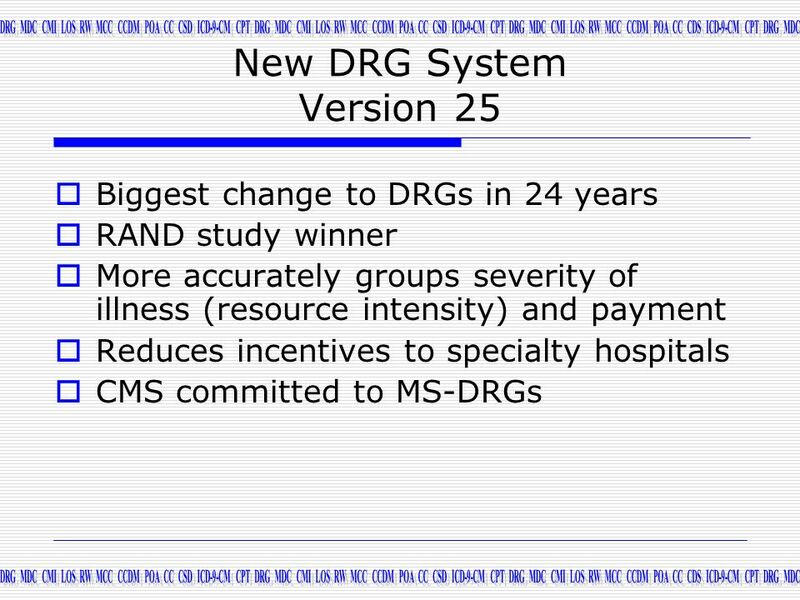 The Discharge Summary: What PCP’s and coders want J Rush Pierce Jr, MD, MPH Lenny Noronha, MD Hospitalist Best Practices Conference November 20, 2009. 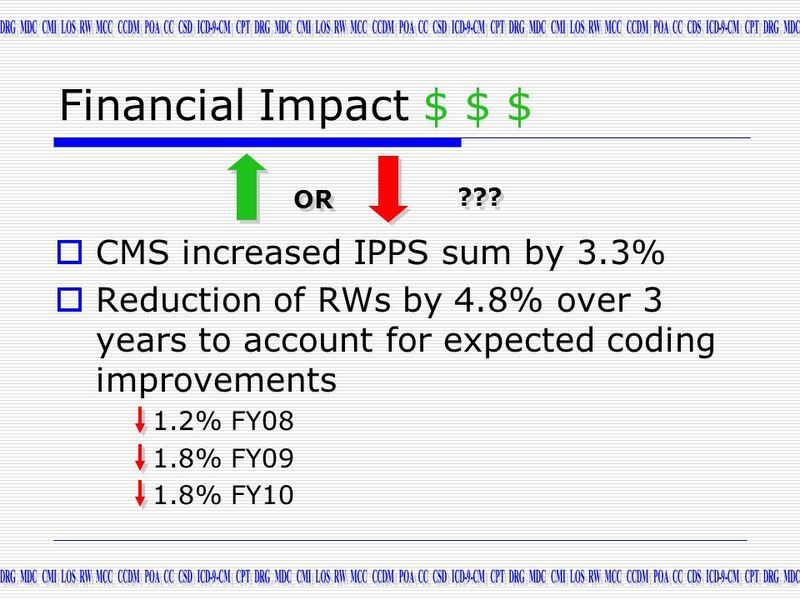 ICD-10 Overview Jacqueline L. Candelaria Program Analyst April 25, 2012. The DRG Assurance Program creates a bridge between the gap. Inpatient Prospective Payment System: To Reform or Refine? Parashar Patel Vice President, Reimbursement & Outcomes Planning Boston Scientific Corporation. Medicare Inpatient Hospital Payment: What Changes Can Your Hospital Expect? Midas+ Xerox Hospital Readmission Penalty Forecaster. 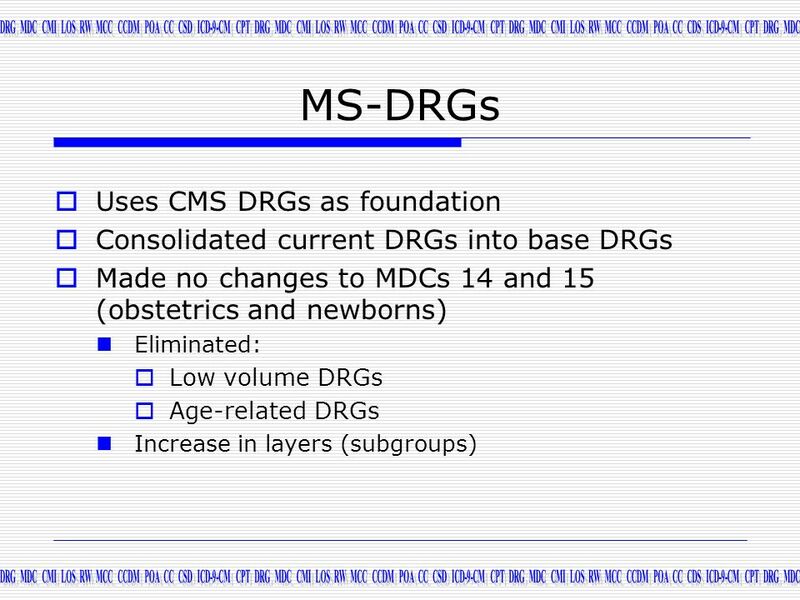 The Transition to What you need to know for Endocrinology Date | Presenter Information.